This is no tragedy: my parents lived long and happy lives and did not suffer terribly at the end--they just got old and died. I lost them both in the last 10 years. It just seems like I never stop missing them. Every time something good happens, I want to call mother up and tell her. And I miss my dad so much. 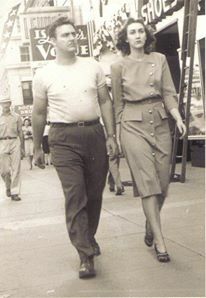 They were WWII generation (my dad was a navigator and bombardier on the B-26 Marauders during World War II) and I'm a 60's generation kid--so we had lots of disagreements--but I doubt I ever let a week go by, no matter were I was on the planet--without either calling or writing a letter. I miss them so much. I don't believe in anything supernatural (not a Christian, or any other religion), so I don't have that comfort, and don't want it. That is my right as a free person in America, so please don't impose that on me. It is my opinion that if I see them at the moment of my death it will be an hallucination, but I would be delighted if it turns out I am wrong. Unlikely, though. How do you deal with grief like this? There is no solution. I feel for you. My dad died in 1987, and Mom died three years and six hours ago today. Grief is such a weird twisty nonlinear thing, and our society doesn't allow us to work it out effectively. Most people are supportive for a month or two-- maybe even extending it to the nearest holiday, birthday, or anniversary-- then after that, it's like "Geez, move on already." Even people who have experienced loss themselves are like that, oddly. What I do is take care of myself, live my life-- and when an emotional sucker-punch comes up, I acknowledge it, breathe through it, and do what I have to do to handle it and/or get through the day. I've been up all night, and am currently too caffeinated to tell whether it's about Mom or just my long-term insomnia acting up! So today I'm going to go play in the craft store, pound the living shiznit out of the elliptical machine at the gym, paint my toenails, and do other things that I know feed me. If I start crying at some point today, so be it (I'm a grownup; I can handle it maturely, even if it hits in the middle of a store). If not, that's fine too. I also lost both of my parents. I was 21 when my father passed, and 26 when I lost my mother. It was almost like the end of my world when my dad died. He was my best friend, and my hero. I lost them both to cancer. I have had a lot of instances when something happened, good or bad, and I have wanted to pick up the phone and call one of them. I was very close to them both and lost them to cancer. I took care of them until the very end. I know you don't want to hear about religion but I am going to through this in. There was a very big difference in the loss of my mother and the loss of my father. For my father, it was so hard for me to understand and come to terms with. Five years later, it was not the same with my mother. I had given my heart to Christ. I did have a better understanding of death. I was more accepting. There was a huge difference between my brothers and sister and I as far as that was concerned. OK, done with that part. You will always remember them, and you will always think about them. Over time it gets a little easier, and then a little more easy. I'll be 40 in a few weeks, so it has been a while since their loss. My mom died on Christmas eve 2000, and for quite a while, I had a pretty hard time with Christmas. Now I enjoy it more than ever. I think of them a lot and usually it brings a smile to my face. Sometimes sadness, but usually a smile. How sad for you; you were very young when your parents died! My dad was my hero, too, and my mother was very beautiful, very artistic. Dad was a sort of Chuck Yager character with deliberate bad grammar. Tough as nails, Oklahoma farm boy. So often, I want to go home---and there's no home to go to. jt, nice looking Mom and Dad. I'm sorry you are having difficulty. My Mom passed away in 1992 and Dad passed in 2004. I'm an only child and was devastated each time I lost my parent. When Mom passed, my then husband was anything but supportive. I floundered for years. When my Dad passed, my late husband was such a rock for me. I got "better" much quicker. I, too, had almost daily contact with my parents and sometimes still get the feeling of wanting to call. It doesn't "hurt" so much but just saddens me now. I have come to accept that there is "no home" to go back to. Time to be a "big girl". That's what my parents would have wished for me....to be happy and healthy. I'm as happy and as healthy as I can be, which isn't saying much with the death of my husband and my MS, but I try. Just try and think of what your parents would want for you. Being miserable or trying to live life as well as possible? I know which one they'd want. <<sigh>> Yeah, I have MS, too, and lost my husband. I'm a big girl..you know, dad said once, you know, mom and dad won't be around forever. He was trying to protect me. There is no protection from reality. That "big girl" was for me, not you hon. I didn't even know if you were male or female. I heard that "mom and dad won't be around forever" too. Of course I didn't believe it but like you said, "there is no protection from reality". Gosh, I'm so sorry to hear you and I are in the same boat! My condolences for your hubby. Best wishes for your MS. I never left my parents. I had a family and I lived with my parents. when my dad passed, my son was 11 months old. I took care of him. Everytime my ex husband and I tried to move out and buy a house my mom didn't want us to go or she found a reason why it wasn't a good house. So we stayed there with her and my grandma, and i cared for them both. My children had three mommies. Me, my mother, and my grandmother. The kids were never without chocolate pudding! So spoiled by my mother and grandmother. I think I was meant to stay there with my mother until her passing. My other brothers and sisters had their families and were older than me. They had their houses. I took care of her for those 13 months and I wouldn't change a thing. In my life, I have found there is always a reason for everything. Sometimes it takes years for me to understand the reason for things, but in time, it always happens. I understand; it took me at least 15 years to stop thinking "I wish Mom or Daddy were still around to see this". Especially when my son was born, they never got to meet my son. Daddy died in 1985, my grandparents were murdered in 1986, and my Mom died in 1987. I had lost my whole older generation within 3 years and it was tough. And now, within the last five years my two older brothers have passed away. There are only me and my two sisters left from our family. I just take it one day at a time and remain grateful for the people I still have around to love me.